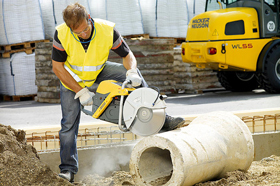 levels are less than 5 m/s², it is possible for an operator to work with the cut-off saw for eight continuous hours per day. 3-stage air filter system with high-performance cyclone filter, foam prefilter and paper filter for very long maintenance intervals. A durable design ensures great reliability. A high-torque engine increases cutting performance and thus productivity. First-class vibration damping with hand-arm vibrations less than 5 m/s² and an optimized spacing between the handles provides greater operator comfort. 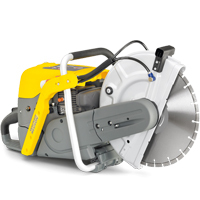 Cutting blade guard with all-round marking of the cutting blade position for precise guidance and exact cutting.